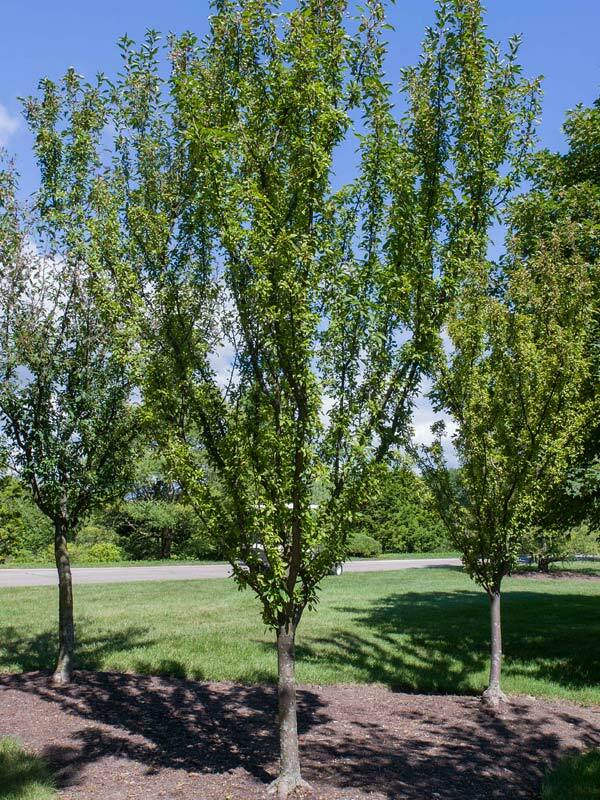 Adirondack crabapple is a small, disease-resistant, flowering tree with upright branches outlined by dark green foliage. 'Adirondack' is consistently rated high across the country as being a superior crabapple. In spring, red buds open to white blossoms tinged with pink followed by small, persistent red fruits. It is one of the most profusely flowered of all crabapple cultivars. Fruits are red to orange red and last well into December. Foliage is medium green and not terrible significant in autumn. The upright form makes this tree excellent in highly formal settings and where space is limited. This crabapple grows best and is most disease resistant in full sun. It will adapt to varying soils including sandy sites and clay as long as the location does not have standing water during the winter. Once established, it is drought tolerant.